Howie Southworth is an experienced teacher, trainer, and facilitator with a background in both student and instructor development. His academic degrees are in computer science (BA) and higher education administration (MA). He has been consulting on the use of online course management systems for the past 5 years, and teaching people how to teach for the past 15. Howie has been invited to teach across the United States, Asia, and Europe. He is the director of education for the Disaster Recovery Institute International in Washington, D.C.
Yianna Vovides holds a PhD in instructional design and technology and works at The George Washington University, Washington, D.C. Dr. Vovides assists faculty with the integration of instructional technologies in teaching and learning. She is the lead instructor in the use of the Blackboard Learning System and Blackboard Content System and designs and implements learning environments for both blended-hybrid and fully online courses. Kemal Cakici has expertise in designing and implementing information systems solutions in the contexts of education and healthcare and has worked as a consultant in industry. He has taught business, information systems, and engineering courses as a faculty member. His academic degrees are in mechanical engineering (BS and MS). He is completing his doctoral studies in information and decision systems focusing on predicting the acceptance and usage of Web-based information systems. Kemal is working as a senior consultant for IMS Government Solutions. Susan M. Zvacek, director of instructional development and support at the University of Kansas, has been involved with educational technology for more than 20 years and has worked in community college, university, and corporate training environments. Dr. Zvacek’s teaching experience includes faculty and dissertation advisor positions at the University of Northern Colorado, Old Dominion University, and Nova Southeastern University. Part I: What’s Blackboard All About? Chapter 1: Your First Look at Blackboard. Chapter 2: The Course-Development Process. Part II: Easing into Blackboard. Chapter 3: Got Learners? (Getting People into Your Course). Chapter 4: Making the Course Your Own. Chapter 5: Building Your Class Materials. Chapter 6: Connecting with Learners. Part III: Earning Your Blackboard Black Belt. Chapter 7: Getting the Most from Blackboard. Chapter 8: Assessing Learner Progress. Chapter 11: Ten Superimportant “Think Abouts” for Building Your Course. Chapter 12: Ten Strategies for Organizing an Outstanding Course in Blackboard. Chapter 13: Ten Ways to Keep Learners Involved by Using Blackboard Communication Features. Chapter 14: Ten Ways to Assess Learning. 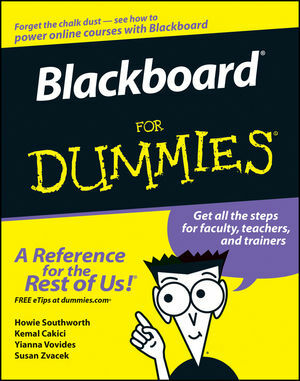 Chapter 15: Ten Questions to Ask Your Blackboard System Administrator. Chapter 16: Ten Things to Look Forward to in Blackboard Learning System 7.1. Appendix A: Real-Life Issues in Teaching with Technology. Appendix B: An Overview of the Blackboard Content System. Appendix C: A Blackboard Course-Building Checklist. Appendix D: Additional Resources on the Web.